Tonight the Pens return to the Mellon arena to take on the New Jersey Devils. This is the third meeting between each team whom are battling for the rights to be called the head of the league. The two previous meetings the Devils put under their belt scoring 4 goals in both contests. With both teams being on some sort of hot streak, 5 game winning streak for the Pens and a 4 game winning streak for the Devils, we should expect a good hockey game, so with that in mind would the Pens be able to break through the trap or would Marty B and the Devils take another W with them heading back to New Jersey? Mark Eaton is out of the line up tonight, Marty Skoula fills in for him. Godard is a healthy scratch for his second consecutive game for Talbot. Pens start out fairly decent with getting pucks to the net, Kuni gets a nice back handed attempt. A couple plays later Sid gets a rush and cuts in from the left wing position but shoots the puck off the side of the net. Ray Salvador opens the scoring with a nice wrister from the point at 4:37. [1-0] Greene and McAmmond with the helpers. TK and Gonch both screened Flower. Addsy gets fired up and lands a nasty hit on Mottau at 14:23 in the first. Billy G almost sneaks one by his former teammate Brodeur on the short side. Tenk also gets a nice chance on the short side again a shift later. TK, Geno and Tenk give the Pens a hard working shift. Pens started to struggle with getting the puck out of their own zone. The Devils had the puck in the Pens zone for about 2 minutes without a clear. Salvador goes to the sin bin for tripping at 11:47. The Pens power play is ranked 30th in the league and it shows it. A Gonchar slapper is deflected to the side of Brodeur. 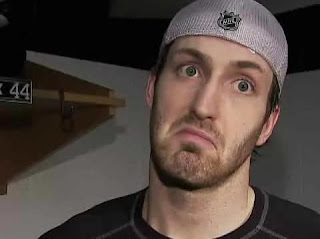 At least the Pens were shooting on this PP. Staalsy send a beautiful cross ice pass over to Gogo who sends a wrister over the net as the PP comes to an end. A few shifts pass before the Pens get another crack at Brodeur as Gogo sets up Dupes for a ridiculously heavy slapper than ricochets off of Brodeur’s leg. Bergfors puts the Devils up by two 23 seconds in on a PPG. [2-0] Green and Parise the assists. Pens couldn’t clear the puck out of their own zone or out in front of Flower which cost them 4 goals. Fleur relieved of his duties and Brent Johnson steps in. The Pens got a little rush going fueled by Mike Rupp but it didn’t last long. They were out shot 16-11 in the second. 0-4 on PP. Big concern of the second period. 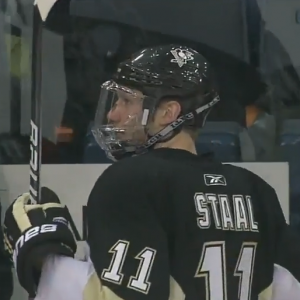 Jordan Staal was hit in the face with a puck. He immediately started to bleed and fell to the ice, you could tell he was in some major pain. Jordo needed help off the ice by Chris Stewart and Matt Cooke. Jordan Staal returned to the ice in full face cage. What an unreal human. The third period didn’t go any better for the Pens, a couple shots here and there but other than that, nothing. At this point you were just praying for ONE goal, but the hockey Gods say NO. Marty Brodeur gets his 104th shut out to surpass Terry Sawchuk and make history against the Pens. Congratulations to @PensBurgh for being PU's Tweet of the Night!